Are you worried about your stretching skin and the stretch marks later? This richly blended butter from Mamaearth gently and safely moisturizes and nourishes your stretching skin. It conditions your growing belly with the goodness of Cocoa, Shea and Jojoba butter. 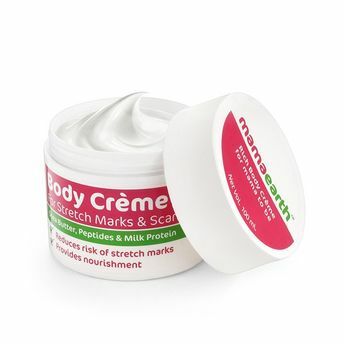 The Mamaearth Stretch Marks Cream keeps your skin smooth and supple throughout pregnancy and even after baby arrives. It doesn’t irritate your skin so you can use it without any worry or concern about its adverse effects. Allow it to pamper you with love and affection and it will make sure it keeps you happy and beautiful, just the way you want. Body Butter to Reduce Stretch Marks and Scars- Shea butter has been used for soothing and accelerating healing after surgeries, and for preventing stretch marks in pregnant women. Natural Nourishment- Milk Protein is beneficial to soothe irritated, dry skin, as it works to hydrate and lock in moisture. Milk protein is best known for its nourishing and healing properties. Lightens Scars- Peptides help to build collagen or restore elasticity to skin can also help with reducing the appearance of stretch marks or scars. Certified Toxin-Free: Asia's first MadeSafe certified brand. Explore the entire range of Anti-Stretch Mark Creams available on Nykaa. Shop more Mamaearth products here.You can browse through the complete world of Mamaearth Anti-Stretch Mark Creams .